When it comes to glass art, the various types and categories used to describe it generally refer to how the piece was made. Handmade glass typically falls into one of three glass categories, these being hot glass, warm glass, and cold glass. There are several different methods and techniques used to create glass art within these categories, so here we explore some of the common terms used. The hot glass category involves working with temperatures of approximately 2000 degrees to create molten glass. The hot glass is then used in the processes of glass blowing, glass sculpting, and casting the glass into molds. Pieces such as goblets, vases, sculptures, hand blown bowls and items, and ornamental glass objects are commonly made using this molten glass that is heated in a furnace. The cast glass is created by using this same molten glass and placing it into a mold with a ladle. To create such glass pieces as slumped glass, fused glass, kiln casted glass, kiln glass, bent glass, and pate de verre, the warm glass process is used. This involves heating glass in a kiln or oven at temperatures of anywhere between 1250 to 1600 degrees, depending upon the type of glass being created. Any type of technique or processes used in glass making when the glass itself is not hot are referred to as cold glass working. This could include such processes as etching, engraving, grinding, and polishing. As part of the “hot glass” category, the art of glass blowing involves using a technique where the hot, molten glass is inflated to form a bubble. Using a blowpipe or blow tube, the glassmaker will then blow the glass into the desired shape. The two main methods of glass blowing are free-blowing and mold-blowing. Free-blowing techniques have been in use since the 1st century BC. The glassmaker will blow small puffs of air into a molten blob of glass, known as a “gather,” located at the end of the blowpipe. This blowing cools the interior of the glass and creates an elastic type “skin” on it, while cooling also happens to the outside of the glass blob from exposure to the air. The glassblower can quickly inflate the glass using this method and form it into a specific shape. Mold-blowing appeared around the 1st century AD, an refers to a technique used in which the molten glass blob is inflated much in the same way as in free-blowing, but is blown into a carved wooden or metal mold that acts to form the shape. Part of the “warm glass” category includes fused glass. This is a term used to describe when pieces of glass are heated to a high enough temperature of between 1400 to 1600 degrees, in order for them to become hot enough to melt together. This technique is commonly used to create such items as beads, jewelry, glass tiles, and is often combined with the technique of “slumping” process where glass is heated just to the point of being hot enough to bend and is then placed into molds. Stained glass can be used in reference to the colored glass used in creating a stained glass piece, or to refer to the finished product itself. Metallic salts are added to glass during the manufacturing process to create these beautiful colors. Typically, small pieces of the colored glass are placed within a framework, with the pieces being separated by strips of lead. 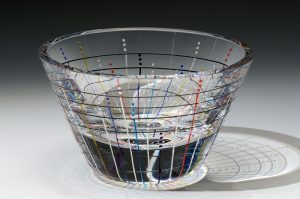 Sometimes, instead of using the colored glass to begin with, the artist will paint pieces of glass, which are then placed in a kiln to fuse the paint to the glass. Stained glass can most commonly be seen in the beautiful, decorative, colorful windows of churches. Finished pieces of glass can also be painted to create a work of art. Painted glass art first requires a clean glass surface, so wash and dry very thoroughly. Then use either rubbing alcohol or white vinegar to further clean the surface of the glass. If painting an area where someone’s mouth might be near, such as a wine glass, make sure to mask off about an inch of space from the rim down to prevent paint getting on this area. Create your own design to cut a stencil from, or purchase a pre-cut stencil. Secure the stencil to the glass item to transfer the design onto the glass. Then comes choosing the right paint for glass painting. Some paints are more suitable for glass painting, such as enamels, and can even be cured so they can go through the dishwasher. Some enamels require a top coat of primer, so always makes sure to check the labels before purchasing paint or beginning any glass painting project. Acrylic paints can work too, but will require a high quality varnish application on top of the paint. Some paints will require air drying, while others require heat drying by placing them in the oven. Be sure to read and understand directions thoroughly before beginning any project, and ensure that you have adequate ventilation. Also, before doing any painting or using varnish, read all precautions and prepare the area and yourself for painting. There are several paint choices to select from, some being transparent, some frosted. There are even glass paint markers that will require baking the piece after painting to set the paint. Also take note of whether or not the paint you’re thinking about using is non-toxic or not, because this can make a difference depending upon what you are painting. Any mistakes made during the painting process can be corrected by using nail polish remover. After the painting is complete, drying time for air drying may take anywhere from 24 hours to a period of three weeks. If heat drying the glass, follow all manufacturers instructions. Glass art is a beautiful way to create stunning pieces of art in the form of windows, glasses, ornamental items, and much more. While techniques such as glass blowing and firing glass in the kiln are not things most hobbyists can do at home, other glass art techniques such as glass painting will allow even the novice glass art enthusiast to create something wonderful.